A youth art show along Telegraph Avenue. Christina Victor teaching a flag making workshop. Flag Day (June 14) seems to go by each year with little fanfare, finding itself nestled in the corner of neglected holidays with days like Columbus Day and Thomas Jefferson’s Birthday. However, this year the Oakland International High School is giving us a proper reason to celebrate it. Students at the non-traditional high school that provides refuge for recent immigrants to the US have been working with artist Cristina Victor and Interface Gallery to produce twelve banners that will be hung along Telegraph Avenue between 51st and 45th streets starting June 14. The banners explore the cultural identities of the student population at OIHS, a population with thirty different homeland flags, and celebrate the flag’s ability to visually represent individual and collective pride. 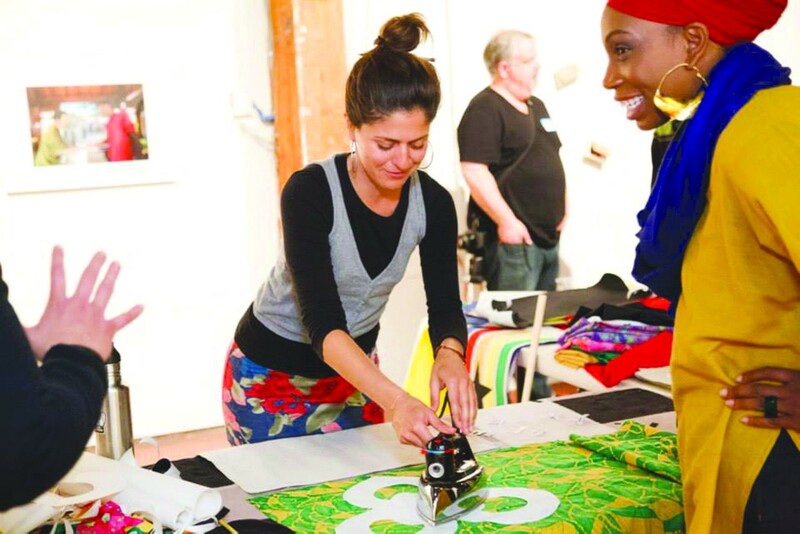 On flag day, from 5–7 p.m., the artists will be hanging out on 47th and Telegraph, ready to answer questions and celebrate their finished projects. If you miss the opening, you’ll still be able to see the banners as they brighten up the streets of Oakland for the following four weeks.